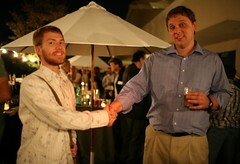 I’m really disappointed I couldn’t make it to the TechCrunch Party last week – which by all accounts was a blast. A while back I thought I might be in San Fran at the same time of the event, but unfortunately things fell through (and the foiled terrorist plot allegedly included plans to target the LHR->SFO route I use with United at the same time as when I would have flown, eeek). Anyway I look forward to the next one. Next Post Microsoft UK/Ricky Gervais viral videos – are they real? The 2.0 bubble will have gone pop by then all so many websites will tell you.